December 8, 2017 is the release date for the new Oyaide Armored series of electrical AC plugs. Available in three versions; AC-004, AC-037, AC-029 (Platinum + palladium, Thick meat silver + rhodium, No-plated barrel polishing). The Japanese hi-fi market exists alongside a healthy DIY audiophile scene. The Akihabara neighborhood of Tokyo is a great example. One step off the Sobu line and a world of electronics specialty stores become available for professionals and hobbyists alike. One of my favorites, Oyaide Electric shop provides cables, connectors, and parts for building your own audio, video, and power cables/distributors. Oyaide is a long established electrical wire company that has been in business since 1952. 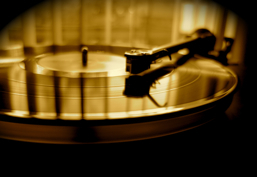 Over the last 30 years they have grown to develop products for the audiophile and pro audio markets. Materials for Oyaide Elect. are developed and produced in Japan with a combination of technological innovation and traditional craftsmanship. Oyaide power distribution materials are carefully auditioned and produced to provide tonal options for audio enthusiasts and professional musicians. Both the AC wall outlets and power plugs from Oyaide have been developed with several different base alloys and platings. Their standard 15 amp Power plug and IEC connections (P-004/C-004) have become available with and without the plating of platinum and palladium. This has allowed me to listen to various power cables (Acrolink, Oyaide) and hear how they interact with different plugs and outlets- giving me a better understanding of what the AC conductors sound, which inludes: dielectric materials, shielding, plugs and ultimately the outlets they interface with. After investigating several brass alloys, I have come to appreciate the sonic qualities of the Beryllium Copper alloy when used for AC power in highly resolving audio systems. Beryllium Copper is used for its spring like qualities combined with electrical conductivity. This alloy has corrosion resistance and maintains its original shape due to its ductile properties. The Oyaide R0 AC duplex is made of beryllium copper for the contacts and PBT (with 30% glass) for the thermoplastic outlet face. Mechanically, the Oyaide duplexes provides excellent AC blade retention, and the PBT and glass filled body helps dissipate unwanted vibration. The R1 employs the same construction but adds a plating of platinum and palladium to the AC receptacles base alloy. To satisfy my curiosity, I built a passive power distributor from Oyaide called the MT UB. This 2 mm thick brass and nickel/chrome plated 2 duplex box exemplifies Japanese craftsmanship. Four separate mounting poles with special washers allow each duplex to be well isolated from each other. I wired it with high-purity Japanese solid core copper and used one R0 un-plated beryllium copper duplex and one R1 plated with the platinum and palladium. I will try and describe the sonic differences of each outlet below. Oyaide R0 duplex: This un-plated Beryllium Copper AC outlet provides an un-hyped and natural soundstage when used on analog and digital equipment. Compared to several other outlets with various metal platings, the R0 has provided me with the most neutral sonic presentation, a robust and taut distribution of power without any accent in the audio band. The R0 excels at dynamic sound with full energy at all octaves. Oyaide R1 duplex: Beryllium Copper plated with platinum(0.5 μ) + palladium (0.3 μ). This outlet helps create a sound of focused and refined sonic presentation. While the un-plated R0 maintains an organic flow to the music, the R1 also adds a sense of lowered noise floor with some equipment, and I found that digital gear and video (improved contrast and blacks) benefited most from the R1 outlet. While I still hear a neutral presentation (Sonically), the R1 has a highlighting or spotlighting ability, albiet subtle. Over the last decade I have been experimenting with various aftermarket power cables and power conditioners. Sometimes with fair results, and sometimes the cables or conditioners have effected the sound negatively. Starting with a materials based approach, I have been able to better understand how different conductors, dialectics, plugs, and AC receptacles will effect the sound quality of professional and audiophile sound systems. Oyaide Electric company has provided a basis for AC materials to be judged in audio systems, see for yourself. Caution: AC power distributors and cables are serious and should only be built/worked on by trained/licensed professional electricians. David Hill of Crane Song LTD builds some genius pro audio equipment. His mic pre amps and compressor designs have always held a special place in my sonic memory. I’ve been lucky enough to use his gear in broadcast studios and through my own personal music recordings. 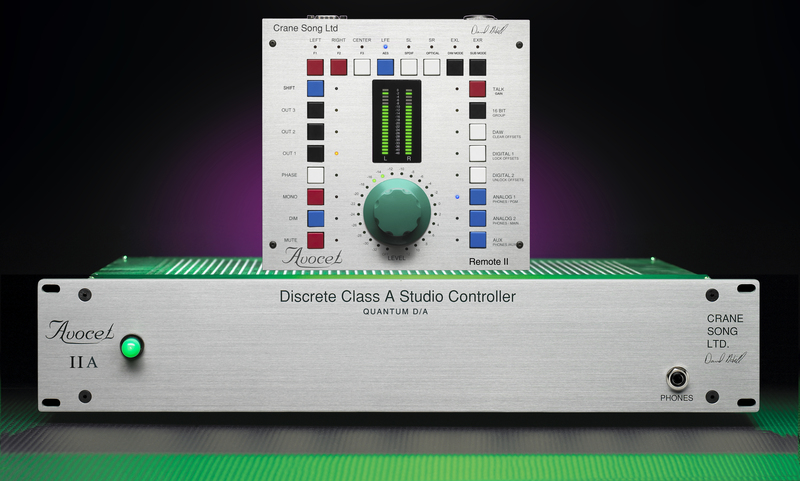 The Crane Song Avocet is a Class A monitor controller with a built-in DAC (Digital-to-Analog Converter). Having undergone 5 iterations, the current Quantum DAC boasts impressive jitter specs and uses a proprietary reconstruction filter for accurate time domain response. Operating asynchronously with a 32 bit architecture, the reference clock is less than 1pS and all digital inputs are up-sampled to 211Khz. Upgrade Note: If you are sending in your Avocet for the Quantum DAC upgrade, you will receive an optical input that replaces the original dual wire AES input. Cool, now you have AES, S/PDIF, and Optical. The design is utilitarian and solid- sporting a modern industrial build with primary colored buttons and center volume knob. This might sound strange, but it always reminded me of Jacque Tati and his modernist take in films like Playtime (go to 23 sec). Monsieur Hulot would surely get lost in the maze of colored square buttons ;). The Avocet proves smart modern design can improve the future for all…err, yeah that is… for Audio Engineers! Talking with David Hill at AES last year revealed his excitement about this new Quantum DAC design. In particular, David felt that the combination of filters being analog and some digital help provide a more realistic impact of sound. His words, if I remember correctly were, “a snare hit now sounds more like the real snare.” Now that I had Mr. Hill’s new Quantum DAC in hand, it was time to test it out. To listen, I brought the upgraded Avocet down to a studio with Lipinski speakers and amps. There, we also had a previous generation Avocet to listen to and compare. A good hour of warm up was given, and a couple more listening to various digital audio sources from the SADiE DAW. Quantum entanglement aside, we began listening to this latest generation DAC design from Crane Song. Using some familiar music tracks, we fed the Quantum DAC via AES/EBU, then out to the Lipinski speaker system with amps. It certainly sounded good right off the bat, but only after spending a little time did all the new sonic upgrades become clear. Switching to the previous generation Avocet DAC proved that this new design provided a more robust or dimensional envelopment to sounds. David was right about the snare sound. Even more, the guttural impact of kick drum was solid and more 3D. Instruments achieved a more realistic timbre and acoustic space with this Quantum DAC upgrade. While the previous generation DAC is no slouch, this new design allows a more fleshed out roundness to the instruments in the stereo image. The user-interface offers simple and functional controls that allow you to smartly and intuitively work. With the precise relay based volume control (with offsets for level matching) and brilliant class A output stage, the 5th generation Quantum DAC furthers audio resolution while maintaining full control of your audio sources. The Crane Song Avocet maintains its place as the hidden gem of my audio experiences. My highest recommendation. Achieving the full performance/responsiveness out of my speakers has motivated me to examine various amplifiers designs lately. In this quest to squeeze the last sound molecules from my speaker drivers, I have been comparing class A, Class A/B, Class D, and now this hybrid Class H and AB design from Benchmark and THX. Delivering clean power with an exceptionally low noise floor are the key ingredients to Benchmark’s new Amplifier. The AHB2 is a 2 channel audio amplifier with 100 watts of power into 8 ohms, and 190 into 4 ohms(bridged mono mode 380 watts/8ohms). This super quiet amplifier topology allows for a signal-to-noise ration of 130dB unweighted. The distortion is also quite low, at 0.00011% THD in stereo mode. With a clean and tidy footprint, The front panel allows access to 1 power button, and several LEDs that indicate proper operation. Benchmark built into the AHB2- a power supply fault protection to monitor voltage, current, and temperature. If issues arise, the fault circuit mutes both channels to protect the amplifier and speakers. The clip lights will illuminate when occasional clipping is present (something that never happened for me), and the fault protection kicks in when severe overdrive occurs- to protect speakers. On the business end of things, connectivity is straight forward. Other than the addition of Speakon connectors, the Balanced XLR inputs and speaker terminals are standard. One dip switch on the right controls mono or stereo operation, while the 3 position switch on the left controls input sensitivity – a welcome feature. Matching the input sensitivity allowed me to optimize the Gain control between the Crane Song Avocet and the AHB2. Technically speaking, the AHB2’s Vanishingly low noise floor can be compared to the dynamic capabilities of a 22-bit digital system. Most current professional and audiophile DACS can also achieve very low noise floors – a match made in audiophile heaven. I used the Crane song Avocet and several other DACs to feed Balanced stereo program material to the AHB2. For speakers I used my Green Mountain Eos HX 2-way speakers. All cabling was balanced solid core copper. I gave the Benchmark amplifier some time to warm-up and have had it in my system for several weeks. My initial reaction was in the form of a grin, as I heard my music amplified in a clear and coherent manner. The extremely low noise floor became revealed as orchestras truly faded to the acoustic space and black was truly black – no residual noise whatsoever from speaker drivers. Even more obvious was a clarity to the amplification. This amplifier runs like a high-performance sports car. I was amazed at the AHB2’s ability to keep up with dense music mixes and never sound congested or lacking. In fact, this tidy beast produced some of the tightest low end I’ve ever heard in my 2 way speakers. The midrange was articulate and clear with an obvious clarity that bested my current class A/B amplifier. Extending to the high frequencies were equally clear and distortion free, no hype here- just honest clean reproduction. Listening to Beck’s “Morning Phase” (24/96) was ear opening and lovely on the AHB2. The track “Morning” enters with acoustic guitar strumming and stereo vocals, and leads into lovely strings with reverberant stereo space all around. Even with this wash of sounds, the hit of the Floor tom, or the crisp full fleshed out sound of the snare was colorless and clearly projected. The Royal Liverpool Philharmonic’s performing Hovhaness’ Mysterious Mountains (Telarc 16/44.1) was sublime. Mount St. Helens Andante, Grazioso unfolds gracefully and with tip top double bass walking the piece along. The bass holds true and rings out even as the full strings come into glide the momentum along. The expansiveness of this orchestral recording is deep and wide with excellent localization. Acoustically, the AHB2 performs so cleanly and quietly that it resolves the hall and space between musicians distinctly- something professional engineers and audiophiles can equally appreciate. The Benchmark amplifier allowed for dense music mixes to be fully appreciated. Micro-dynamic detail was never lost or distorted, even as complex passages competed. Orchestral and Popular music mixes equally excelled on the AHB2 with authority, control, and balanced sonic presentation. If you are looking for an amplifier that can reveal your source material and DAC without flinching, then the AHB2 is a top choice. For the past couple weeks I’ve been auditioning the Benchmark Media AHB2 amplifier, and will be featuring a full review soon. Inside the tidy footprint and magnetically shielded casework of the AHB2 are a host of unique advances in audio amplifier design….and boy is it quiet! While I was making my way through the exhibition floor at AES139, I ran into owner/designer, David Hill of Crane Song Electronics. I have been a user and big fan of Mr. Hill’s designs and today I was in for a treat. The Avocet monitor controller had undergone some upgrades and David Hill was excited to tell me about it. I was first treated to a comparison of the upgraded DAC, and then we shot a short video describing the various updates to the Avocet IIA Quantum DAC. The way audio cables are constructed can certainly make a difference to their sonic characteristics. Over the past several years I have been comparing the sound transmission characteristics of different copper conductors. In addition to the conductors, different geometries, dielectric material, and shielding can make a cable sound different. While these can influence the sound, I feel the primary sonic impressions I have been hearing have to do with the interaction of conductors carrying an audio signal. Using both stranded copper and solid core copper audio cables in a variety of setups has allowed me to hear the differences. We use stranded copper wire in pro audio applications for a couple of reasons. One main reason is that flexibility is important when dressing microphone and instrument cables. A stranded cable will be much more robust when repeatedly coiled up and unwound. The many strands of thin copper can withstand more bending than a single solid core copper wire. It’s the transmission characteristics that differ. With all those strands the signal tends to jump from strand to strand, and with a single solid core conductor this cannot occur. The sound characteristic of stranded copper vs solid core may seem minute, but any well trained ears should hear the difference. This example from Evidence Audio compares stranded monster cable vs. their solid core cable using a bass guitar. Having heard the difference between stranded copper and solid core copper in my pro audio monitoring chain, I was curious to examine the sonic difference with electric instruments. For this, I employed the help of a 1973 Gibson SG and a Dr. Z MAZ 18 (non-reverb version) tube amplifier. After playing for some 30 minutes with a Mogami stranded copper cable, I switched to the Evidence Lyric HG. My first impression was that a haze had been lifted from my guitar sound. As I continued to dig into this new-found sonic experience I also noticed that my SG had become more responsive to my playing. Rather, a dynamic contrast now clearly existed and I was in control of the shading. Switching back to the stranded copper cable immediately sounded blurred. The word that comes to mind is distortion, or disruption of the original signal. The guitar sound was now less pure. I want to avoid using words like darker or brighter, because what I was hearing had to do with the signal integrity. Yes, the stranded cable might sound darker, but I feel blur is a better word. On the other hand, the solid core guitar cable was clear and did not adding anything to the original signal. To further examine the sonic benefits of solid core copper cable, I pulled out an analog synthesizer. The Elektron Analog Four is capable of producing a variety of sounds with its analog oscillators, filters, and beyond. For this test I chose to use a simple sawtooth waveform and a sub oscillator from this analog synthesizer. After using the stranded Mogami cable for the initial listening, I swapped it out for the Evidence Lyric HG balanced cable. The clarity of the sawtooth wave when transmitted over solid core wire was evident, but when I began adding sub harmonic oscillators, the difference truly stood out. Sonic integrity comes to mind. While adding sub harmonic oscillators to the original sawtooth waveform I was very pleased to experience a more (obvious and clear) layered sound. These solid core cables from Evidence audio truly allowed me to hear the various harmonic additives I was creating on this synth. Moving back to the stranded copper showed me that the full tonal characteristic of the synth was lessened to a degree. Adding in the sub harmonic oscillator with a stranded cable is easy to hear, but the delineation of harmonic content (clarity) was not as good as with the Evidence Audio cable.